CAPITA - KULT OF POSITIVE FORCEQuality, innovative, creative snowboards. For a better snowboarding experience, more days on the hill, or deeper and deeper pow, choose CAPITA. Whatever it is you want to manifest, it can become a reality when CAPiTA is in your life. This snowboarding brand gives you great graphics as well as all the latest tech to ensure you have the best boarding experience. If you want a quality, innovative, creative snowboard to shred on - look no further than CAPiTA. CAPiTA is absolutely massive in North America and now smashing it in Europe too. CAPiTA are a modern, cool snowboarding brand which deliver on every front. 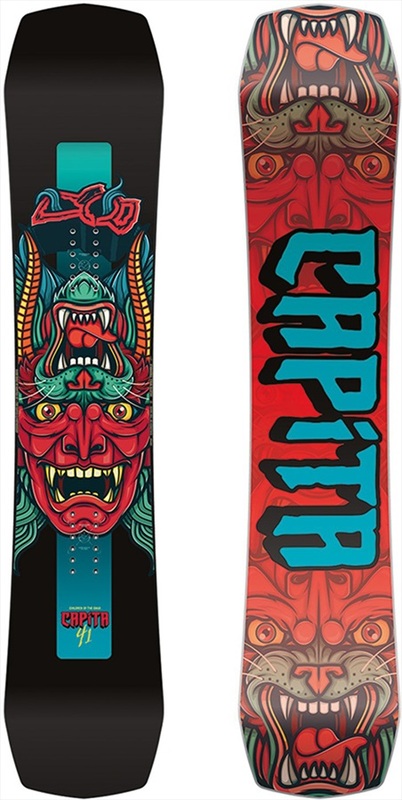 With awesome graphics and the latest technical design, CAPiTA set the standard for freestyle specific snowboarding. In order to control the torsional and longitudinal flex of boards, they use perimeter-weighted glass lamination to ensure the proper resin to glass ratio is accurately calculated. There are two basic types of base material: extruded and sintered. If you don’t like to wax often, but you do repair your base when necessary, extruded is for you. If you are more interested in going faster, longer, sintered is your base. Capita moved into their own custom built factory called the Mothership in Austria. This has elevated the boards even further and Capita's board have never been better, along with their innovative collaboration with Spring break snowboards and the introduction of the slush slasher. This along with the other amazing shapes, has brought new life into snowboarding and with a strong team of dedicated reiders inclduing: Kazu Kakubo, Scott Stevens, Jess Kimura, Dan Brisse and many more! Capita say 'We Devour Everything', which in this case has never been more true. Get the kids stoked on snowboarding with a fun & easy to ride Capita snowboard. Spin, Jib, slash & Bonk your way through the streets, parks & the entire resort. Capita's tween-age destroyer, bridging the gap between the groms & the men. The Capita Warpspeed is a dedicated wide freeride model, deigned for the big guy who rides in a big way. Revolutionary all terrain freestyle snowboard - One of the best jib and park boards in the World!